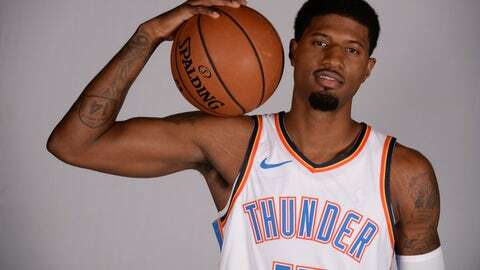 OKLAHOMA CITY (AP) — Paul George is back, and so are the high hopes be brought when he joined the Thunder. Oklahoma City acquired George last year in the deal that sent rising star Victor Oladipo to the Indiana Pacers. It was thought by many that Oklahoma might be just a detour on George’s road home to Los Angeles to play for the Lakers. Instead, Russell Westbrook and the Thunder made a winning sales pitch. George, an All-Star and one of the league’s best two-way players, shocked many by staying instead of leaving in free agency. George’s return is fueling hopes that Oklahoma City can improve on a disappointing, inconsistent season that ended with a first-round playoff exit. The Thunder traded Carmelo Anthony during the summer in a deal that brought guard Dennis Schroder from the Atlanta Hawks. Schroder, who averaged 19.4 points and 6.2 assists last season, has been dynamic during the preseason. Thunder guard Andre Roberson, one of the league’s top perimeter defenders, will be out for at least two months following a procedure as he recovers from the torn left patellar tendon that cost him the second half of last season. Oklahoma City’s defense suffered without him last season, but Schroder could make up for his absence with his athleticism and scoring prowess. George acknowledged that things didn’t go as planned with Anthony, who struggled at times last season. Anthony is now with Houston, and Oklahoma City has become younger and faster. The Thunder also kept versatile, ultra-athletic forward Jerami Grant. He can play the forward spots and even center if the Thunder choose to go small. George considers Grant a key piece to Oklahoma City’s puzzle. The Thunder added Nerlens Noel as a backup center. The No. 6 overall pick in the 2013 draft who most recently played for Dallas is a rangy, mobile defender and a capable finisher around the basket. Oklahoma City will be able to play fast with a legitimate rim protector while he is in games. The Thunder open the season in Oakland against Kevin Durant and the champion Golden State Warriors on Oct. 16. It’s the ultimate early test to see how much the Thunder have progressed, and perhaps how far they have yet to go.